The waiting and speculation have finally come to an end: Samsung has exposed the secret about the successor models for the Galaxy S7 and Galaxy S7 Edge, launching another real flagship duo in different display sizes with the Galaxy S8 for €799 and the Galaxy S8+ for €899. But what are the newcomers bringing to the game? And can they knock the reinforced competition from China - namely Huawei - from the top spots? Our extensive lab test answers all the questions. The 8 models have certainly become real beauties: with their curved displays, which are considerably longer than usual thanks to there being no home button, and their almost frameless fronts, they really stick out from the smartphone mass. And they awaken covetousness: the tester had an immediate "I want one!" feeling upon first contact - a feeling they are not likely to be alone in having. The special display format defines the symmetrical look of the device on the front with particularly thin areas above and below the screen, which does them both a lot of credit. As is usual with Samsung, the Galaxy S8 models have an immaculate finish: a subtle metal frame holds together both Gorilla Glass 5 panes on the front and reverse, which are protected against scratches and fingerprints. The duo are very elegant and refined - at least they look as expensive as they unfortunately are. For both models, consumers can select between the colours Midnight Black, Orchid Grey (a grey tone with a purple gleam), and Arctic Silver, which can be seen under the reverse glass side. Depending on the version, the metal frame can be given a different coating: Black for Midnight Black, Chrome for Arctic Silver, and Titan for Orchid Grey. All three have a good look, although the grey tone was the tester's favourite. Both models sit comfortably and well-balanced in the hand. The design sees the sides fully rounded, which makes holding the phone pleasant even after longer periods, although the weight of the S8+ has gone up slightly compared to its predecessor. Despite the glass reverse, the S8 models are not excessively slippery even in wet hands. You should still be careful in such situations though. The concern that the touchscreen will turn off unintentionally more often while holding it in the hand due to its frameless design luckily got put to rest very quickly in practice. The edges of the Galaxy S8's screen are much less sensitive to touches than was the case with the Galaxy S7 Edge. The newcomers' casings are not just impressive due to their chic design, they are also pretty tough: the pair have an IP68 certification, protecting them against dust as well as up to 30 minutes submersion in up to 150 cm of clear water. As with other manufacturers, this does not apply to submersing in salt water and other fluids like alcohol and soapy water. No wonder, because the seals will give up some time with exertions like that. The Galaxy S8 and S8+ also really have their compact dimensions to thank for their excellent handling. All the same, the S8's display measures a tidy 5.8 inches, pushing it into phablet territory. Yet in direct comparison to the Galaxy S7 and its 5.1-inch screen, the newcomer's casing is 2 mm thinner and only 7 mm longer, meaning the Galaxy S8 also fits nicely in your pocket. This is not necessarily the case with the S8+ however: the larger flagship model has a massive 6.2-inch display, again with the casing growing just 7 mm in length compared with the Galaxy S7 Edge's 5.5-inch screen. In comparison to their predecessors, this means that the Galaxy S8 models have added considerable size to their displays, but have maintained their compact dimensions. The Korean company has managed this feat by getting rid of the home button on the front of the Galaxy S8 devices, as mentioned before, and used this new free space to considerably extend the screen to an uncommon 18.5:9 format (16:9 is normal). We will see this trick with the competition's models soon. The image quality of the displays is once again phenomenal. Both screens display content in such brilliant, crisp colours and an impressive black, making it an absolute joy to look at. The engineers have managed to top the already incredible brightness of the S7 generation. But that's not all: the so-called "Dual Edge" OLED displays are slightly curved around the edges, making for an almost frameless appearance - that Samsung advertises as "Infinity Display" - and meaning that now both flagship models have the popular side panels of the Galaxy Edge models. The edges of the display give you access to practical special functions via a slim control panel. The user can determine the size, position, transparency, and device side that the control panel is displayed on in the settings. A new optional feature here is the "Edge Lightning" that makes a slim border light up around the outside of the display for incoming messages of selected apps or using the music player. A nice gimmick for everyday use. Not only does Samsung come up trumps with its flagship models in terms of haptics and screen, but the best of the best is hiding under the fancy shell, too. The in-house Exynos 8895 platform has a world premiere to announce, because both Galaxy S8 models are the first smartphones to utilise a 64-bit processor architecture with 10 nm technology. The eight cores in the CPU run at a maximum of 2.3 GHz and, together with the 4 GB LPDDR4 RAM, put in an absolutely top performance. Samsung has been very generous with the user memory, doubling the amount of the predecessors. This means that both S8 smartphones offer 64 GB gross of particularly quick UFS2.1 memory. Minus the size of the operating system, users are left with a pretty meaty 53 GB. You can do a lot this with amount, especially as the combination slot on the front side of the device can hold both a nano SIM and micro-SD card. 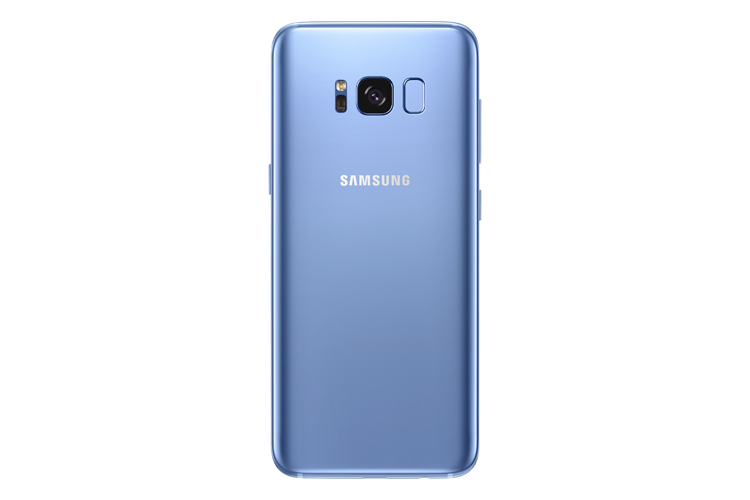 In terms of connectivity, the Galaxy S8 and Galaxy S8+ come out on top thanks to Gigabit LTE, the new Bluetooth standard 5.0, that improves range four-fold and doubles the data transfer rate speed (LE up to 2 Mbps). They also have fast ac Wi-Fi, NFC short-range communication, and a quick and modern USB 3.1 C port. These features are completed with an armada of sensors. Security is handled by the iris scanner on the front, facial recognition via the front camera, and the fingerprint sensor, which has now wandered over to the back next to the camera. The trio functioned reliably and quickly in the test. On the reverse there is also the practical heart rate monitor underneath the flash. The tester was anxious to see how the pair held up in the publisher's lab, because in terms of power the Galaxy S8 has a 3000-mAh battery and the Galaxy S8+ a 3500-mAh battery, putting them in a strong position. The results should not disappoint: the Galaxy S8+ has excellent battery life, lasting for 9:33 hours in display mode. The Galaxy S8 came in with a still impressive 7:52 hours, but putting it clearly behind. Thanks to the quick-charge function, both with a cable and wireless, the batteries can be charged up again quickly. The other test results for acoustics and wireless capabilities were all fine, although the acoustics were just "good". The current Android 7.0 runs as the basis for the system, which Samsung has laid a new version of its own user interface over. It offers new, attractively designed icons and the usual intuitive controls. The Android-specific keys for "Home", "Back", and "Last Apps" are used as soft keys and can be blended into the lower part of the screen when required. Users can define how the last two functions are arranged and their optics. As a reminiscence of the home button, Samsung has come up with something new: there is a pressure sensor under the home soft key that gives haptic feedback when you apply more pressure. Not all of the apps support the new display format, so you can determine in the settings for every app if it should be displayed in full screen. Let's not forget the numerous options that let the user adjust the optics. It's also nice that Samsung lets you choose whether the interface has an app menu or not. You can view the app menu by swiping upwards or by using the traditional icon, which can be blended in. The digital assistant, Bixby, is not quite ready, as already announced at the presentation. That means the voice control, Bixby Voice, is missing completely at the moment. On the other hand, Google Assistant has already been implemented that currently takes over this function and is accessed with a long press on the home area. All in all, Samsung's courage to make changes has paid off, because the Galaxy S8 and Galaxy S8+ are fantastic, if albeit borderline expensive mobile phones. For that you get a huge helping of innovation, great screens, excellent headphones, more storage, and, last but not least, an amazing camera. The focus on new service and security functions is a smart move, because these topics will continue to become more important in the future than pure performance figures. The particularly long-lasting Galaxy S8+ secures the top spot of the connect leader board by a long way with its brilliant overall performance. The Galaxy S8 is just behind it on place three. Respect to this performance!